Keeping Up With the McCaslands: Another Celebrating Home Giveaway! I hope that the day after Halloween is finding everyone well and bellyache free! I can't say so much for myself. I think I inhaled a few too many Tootsie Rolls while passing out candy last night! After Halloween, I am always ready to get into the full holiday swing of things. My birthday is coming this weekend, Thanksgiving is right around the corner, and of course there are only 54 days until Christmas! We have so many things to celebrate and be thankful for. One of my favorite things about the holidays is all of the great food I get to share with my friends, family, and coworkers. I love to bring a dish that looks pretty, and my cooking needs all of the help it can get in the looks department! Here's where Celebrating Home comes in. 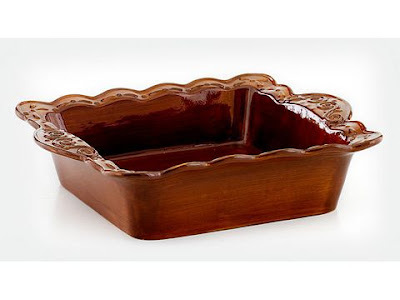 We have gorgeous bakeware that lets you cook and serve out of just one dish. Take a minute and go visit my friend, and fellow smart mommy, Mama G over at Growing Up Geeky to enter for a chance to win a Venetian Baker! Hi, Kirby! I'm entered in the giveaway over at Growing up Geeky but I was looking on the Celebrating Home page and there are a couple items I'm thinking about ordering for the holidays. Since you are a consultant would I order through you or is there a way I can recommend you so they know I found them through you?